God has a disturbing fixation on burning animals. I mean, if you took all the animal sacrifice stuff out of Leviticus, you’d have just a couple chapters left. Most of it’s hyper-focused on killing animals for God, especially in these opening chapters. One rather begins to get the impression that he created humans and tempted them into sinning just so he’d have everyone bringing him barbecue all the time. That’s so very… uplifting? Things get really graphic when God gets to the birds. That’ll certainly bring new energy into the church service. in a nutshell. Now, don’t you feel ever so much more holy? Copyright © 2016 by Dana Hunter. All rights reserved. 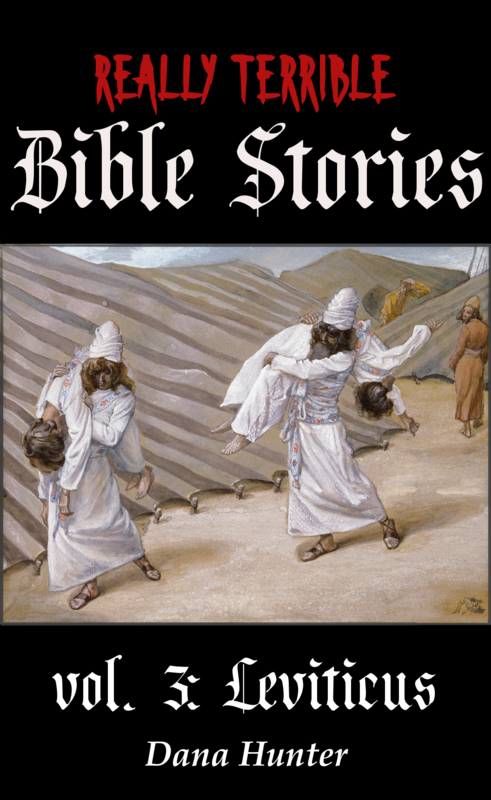 Really Terrible Bible Stories vol. 3: Leviticus coming soon! Pick up your copies today! I have read that the Hebrew fetish for blood sacrifice is what may be responsible for the story of the bloody execution of Jesus. Blood was required by God to pay for sins. I guess nowadays God would be a meat and potatoe guy. From a documentary I saw recently it seems the priests derived a lot of their income from selling the sacrificial animals. Many cultures in that region also made these kind of sacrifices and part of the meat was burned for the gods and another part eaten by the priests and the audience. I hate blood pudding, so god’s welcome to my share of it. He’ll have to fight Husband for it, though. Big fan there. He WILL, however, have to battle the both of us for the smoked Latvian-style bacon that is just perfect sliced thin on sweet-sour (black rye if you really must) bread and a slice of onion or a stalk of chive on top. Couldn’t God just pick the animals his own self, and hit them with lightning? That would keep the fallible humans out of the loop.